After managing the stairs and walk to train station we boarded our train to Milan central ready for the connecting train to Bern. Along the way we saw some amazing views of the Italian Alps which slowly turned into the Swiss Alps. 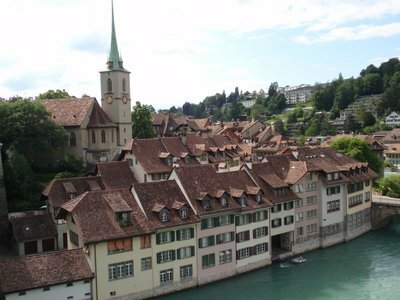 We arrived in Bern to a lot cooler weather and looked very out of place in shorts and T-shirts, lucky the hostel was easy to find especially as this time we had a Google map at the ready (see lesson 5). The glocke backpackers hostel http://www.bernbackpackers.ch was right in the centre just a stones throw away from the zytglogge, the famous clock that just before the hour (4 min to be exact) has characters that chime and move. We were pleasantly surprised with the facilities of the hostel, with a large communal area, good sized kitchen that had everything you needed, clean well kept rooms, showers and toilets plus it had free Wi-Fi (see lesson 6). This was great as we booked this hostel in a rush only a few days before. The first night was to be spent in a private dorm for two and then to save money we moved into a 6 bed shared dorm. Again were presently surprised, as we managed to get a room with a wall dividing two of the beds from the others meaning it felt like a room for two. Once we were settled in to our room and Changed into more appropriate clothing we spent the rest of the day getting our bearings and taking in some of the sights in the capital, even accidentally coming across Baren-gruben the home of the bears for which the town was named. The next day we yet again started at the tourist information getting a map and a list of things to do and started to explore. 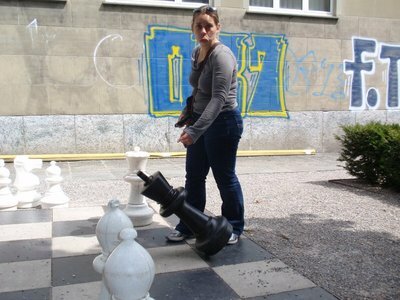 Whilst sight-seeing we came across outdoor gigantic chess we decided to set it up just to take a photo but ended up playing for real and Nick managed to wipe the floor with me, which is a first for him! After that we took a stroll down by the River Aare with the hope of visiting the Bernisches Historisches Museum, however could not believe the CHF28 ticket price (that's each! ), so we made a swift exit and headed off in search of cheaper (if not free activities!) After some more mooching around the beautiful old town of Bern with it's covered walkways and cellar bars and shops, we reached the Munster - the huge gothic cathedral which towers over the rest of the city - and what do you know it was a bargain to climb up the tower at only CHF5 each! The views from the top were incredible. We even waited up there to hear the bells chime! Bern is a lovely quaint city and does not feel like a capital at all! By now we had boring stuff to do and hit the supermarket which is getting harder as we are not 100% sure what everything is! We're spending longer and longer in there trying to understand the labels and see what is the best price - although Nick's German vocabulary is much better than he thinks and we managed to find most of what we wanted. Luckily all of the supermarkets (here and Italy) do a version of "smartprice". In Italy it was "clever" and here it is "budget". The other night I made meatballs out of reduced burgers thinking they we're beef but they ended up being pork, still nice though! By day 3 we had seen most of the main sights and decided against all the overly priced museums and coffee shops. So made a pack up as we have been doing everyday and headed out for a walk from one of the leaflets. The walk was supposed to be 2.5 hours, however we had to walk for an hour to reach the start (there was a bus but being us we walked), luckly this was along the river lined with trees, so very relaxing. Walking here is so much easier then the UK, well the hills aren't, but the footpaths (wanderwags) are really well sign posted and even tell you how long a walk it is to your destination as you go. There are also yellow dimonnds marked on trees or posts at areas where the paths look a little confusing. The walk was varied with, fields, woods and hills although upon reaching the top we didn't quiet get the views we were hoping for, as it was a little clouded over. Nick was convinced it was brightening up so we sat ate our lunch and chilled for a bit, hoping for it to clear. An hour later it didn't seem to be happening, so we headed back down to lovely sunshine and less clouds, typical! 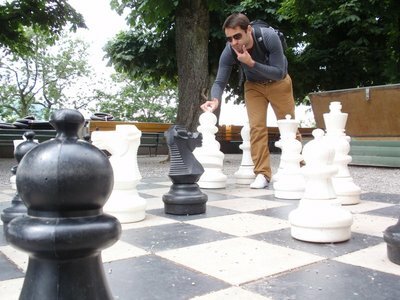 That night the realisation that we had no plans after Switzerland started to dawn on us so we started researching, countries, towns and accommodation. We spent another three evenings of this before finally settling on a route. 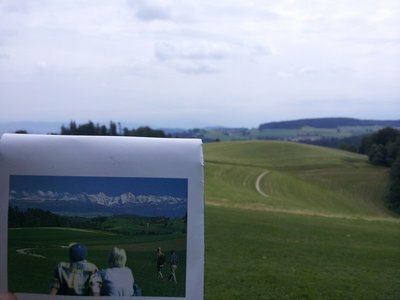 The next day we took a day-trip to Freiburg/Fribourg which is a unqiue place where everyone speaks French and German sometimes within the same sentance. Using my GCSE French and Nick's GCSE German (which was already coming in handy as he remembered a lot if it) we muddled by. A stop at the TI to get a town and hiking map as is the usual now at any new stop. 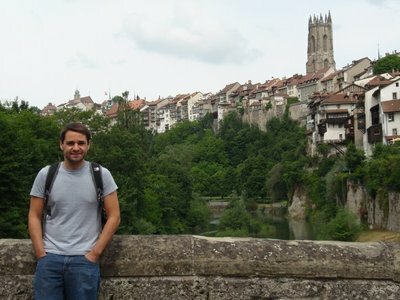 We headed on a self guided walk of Fribourg taking in the lovely old town with it's medieval buildings, winding streets, wooden covered bridge and pretty churches. We then started the Gorges du Gottéron hike which at first started off on a road with a random mini railway that had cows as large as the houses and the oddly placed restaurant. It soon went off road and followed a beautiful stream through a huge gorge meandering and climbing along the valley. Sadly we had a train booked for 3pm so had to cut the walk short to head back. Annoyingly the walk back was quicker than we realised and so we had time to have a coffee (after walking around a few cafes we managed to find the cheapest one!) and settled down for a coffee, it wasn't long before we noticed the icecream. We shared a two scoop cup I think we deserved it after all our activities so far. Yet again the language here confused us as we asked for our order in French and got a reply part in English and Italian. 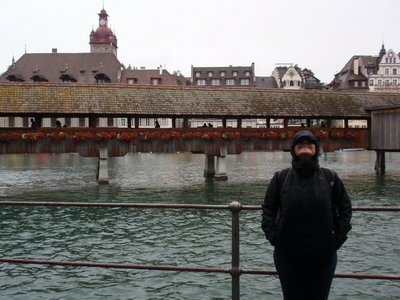 Our final day in Bern, and the sunshine had deserted us completely so we had to don full wet weather gear for our next day-trip to Lucerne / Luzern which promised a beautiful lakeside mediaeval town with wooden, covered bridges and the old city wall surrounded by snow covered peaks. We arrived to a cold, wet and grey busy bustling city. As the clouds were so low we could not see the mountains, and the lake was not the brilliant blue we had seen in postcards. Our plans of heading for a hike were scuppered so we got a Walking-Tour of the city from TI and set out to see what we could. There was a riverside festival taking place which gave the place a real buzz with all of the pedestrian streets crammed with food stalls and markets as well as random stages with bands playing. We climbed the city wall, sheltering from the rain in one of the towers to stop for our lunch (very British!). 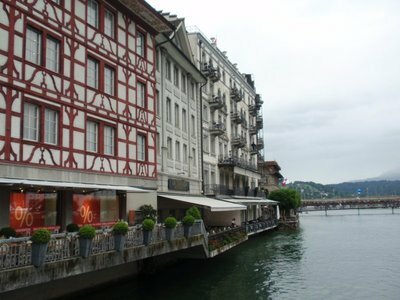 Whether it was because of the weather spoiling our plans or not I don't know, but neither of us were impressed with Lucerne and I do not think it would be somewhere I would rush back to which is a shame. Our final night in Bern was spent researching, booking trains, hostels and packing our bags ready for the train to Interlaken and the promise of seeing the Alps up close!